Thirty years ago this week and long before Floyd Mayweather Jr. and Conor McGregor were in the public consciousness, a true pugilistic "superfight" took place. 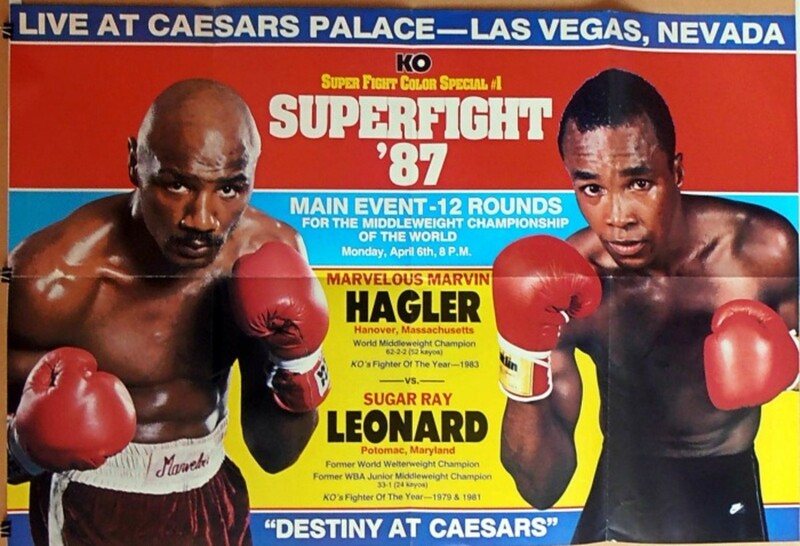 On Monday, April 6, 1987, "Marvelous" Marvin Hagler made the thirteenth defense of his world middleweight championship against “Sugar” Ray Leonard. And, when it was over, the wildly popular Leonard, returning from his second retirement, had clawed out a 12-round split decision victory. Controversial and passion-inducing - as so many all-time great tilts are - the outcome of “The Superfight” as it was billed, only told one part of that night’s story. Side sagas abounded, some which have helped to cement a foundation that has lasted to this day. To that point, Leonard vs. Hagler became the most-ordered boxing pay-per-view ever with an estimated 150,000 buys in a wired universe that was under five million homes. Las Vegas hotel and casino Caesars Palace established a record bid for a site fee, putting up $6.7 million for the right to hold the event. 12,379 paid come through the turnstiles, generating a record-breaking gate of $6.2 million. The show also established a high-water mark for fighter purses as well as Hagler was guaranteed $12 million, while Leonard took home $11 million. Hagler earned more than Leonard, but not for the obvious reason of coming into the bout as the defending champion. Instead, it was due to accepting a deal which would see the fighter paid off with a percentage of what the fight grossed, as opposed to a flat fee. By doing so, Hagler raked in millions upon millions more. Utilizing the spaciousness of the 20-foot ring Leonard’s camp had negotiated, “Sugar” would attempt to evade trouble for much of the round, avoiding exchanges with his heavier hitting opponent and attemping to steal rounds with dazzling displays of defensive prowess and punching speed. A universal betting underdog coming into the fight, the technique earned Leonard a highly controversial decision with its fallout echoing throughout the sports world quickly. Fans of Leonard rejoiced. Conversely, fans of Hagler were incensed. Feeling as though Leonard was consistently beaten through a majority of most rounds, and relied solely on dazzle, some fans and many in the media would ponder aloud if such controversial decisions would finally be the nail in the sport's coffin. Judging from the thirty years that have followed, the answer is a resounding no. “As hammers pounded at ringside, the whole city throbbed in anticipation of the event. It is expected to lure 200,000 visitors and pump about $300 million into the local economy, according to hotel officials. All 60,000 of the city's hotel rooms are booked, and the 20,000 seats for closed-circuit telecasts at six hotels are sold out… The bout already is setting sales records, according to Arum. In New York City, Tavern on the Green restaurant sold out its 1,000 seats at $125 each. It were those 100,000 homes, paying around $25 each, that continued to sound an alarm to the powers-that-be in canvassed matted promotions. That alarm started a few years prior when Leonard fought the other two members of the legendary 80s foursome he and Hagler would be associated with: Roberto Duran and Thomas Hearns. Despite closed circuit arena gatherings still ruling the roost, the past success of Leonard’s bouts against Duran (1980) and Hearns (1981) opened the eyes of keen observers, including Arum, as to the future of audience participation. For Leonard’s fight against Hagler, the promoter focused on the rising interest of the new technology by severely limiting access of clubs, restaurants, and bars to show the event, instead concentrating on closed circuit and home pay-per-view only. By the time Leonard and Hagler rolled around the next year, the bout’s suggested retail price would be set by Arum at $34.99-39.99. While some bristled, the promoter correctly predicted that consumers would be able to justify it due to the magnitude of the matchup and the hullabaloo which surrounded it. Premium cable channel HBO paid Top Rank $3.1 million dollars to rebroadcast the bout only four days later, much to the chagrin of cable operators and closed circuit facilitators. Believing that kind of turnaround was too quick, pundits were already complaining the station, which often reaired bouts only seven days after they took place, was ultimately bastardizing live viewership. Theories that consumers would be content to wait were shot down quickly. The desire to be “in the moment” of an event would only grow in the upcoming years, which happened to coincide with the rise of heavyweight champion Mike Tyson. Pay-per-view replays airing the following Saturday on both HBO and Showtime would become an accepted practice by the end of the 1990s. ABC’s Wide World of Sports would lock up network broadcast rights, which was a practice that had already began moving in the opposite direction. With premium networks, who also handled the show’s production, taking on larger roles, paying increasingly larger sums, and growing in overall reach, the practice of allowing for over-the-air networks to rebroadcast big fights in a timely fashion became passe. Despite the hopes that the highly decorated 1984 United States Olympic team would spark interest, by 1987, networks were still reeling from the brutal 1982 encounter between Ray “Boom Boom” Mancini and Duk-koo Kim on CBS which resulted in Kim’s death from a subdural hematoma. That tragedy, along with being squeezed out of the top tier fights, difficulty in negotiating with some of the sport’s personalities, and general consumer/advertiser interest waning, network sports executives had already begun losing their zeal for the boxing business. And, to this day, not much has changed. An ardent boxing supporter for many years, Anheuser-Busch brewery’s flagship product, Budweiser, invested heavily into the “Superfight” promotion, incorporating the event into its own advertising, and using its relentless presence across media platforms to saturate the marketplace. In doing so, Budweiser would set a standard for future events which would continue to evolve as the pay-per-view boxing industry did. Greenberg boasted the fight would feature twelve cameras, including the introduction to boxing of a super slow-motion camera that ABC had introduced during its coverage of the 1984 Los Angeles Olympics. The story also recorded the celebrity headcount, further driving home the magnitude of the event, and once again proving the allure of a big-time fight. Marvelous, who had legally changed his name to include his moniker in order to control his rights, hadn’t lost since 1976. With the loss, he saw his chance to break Carlos Monzon’s record for middleweight title defenses (14) go up in smoke. Openly contemplating retirement before the bout, an angry Hagler unsuccessfully chased Leonard for a rematch before declaring he’d never fight again. Going on to pursue his acting and broadcasting careers, the Newark, New Jersey, native ended his run being universally praised as one of the top five middleweights of all-time. Monzon’s 160-pound record would ultimately be broken by Bernard Hopkins in 2002, reaching a final total of 20 in 2005. As an aside, Hopkins’ run coincidentally would also be ended due to a controversial split decision loss, coming later that year at the hands of Jermain Taylor. With the victory, Leonard picked up his fourth lineal world championship and in his third different weight class. He too would retire - for the third time - but, unlike Hagler, Leonard would once again come back. In November 1988, “Sugar” won the WBC light heavyweight title from Canadian “Golden Boy” Donny Lalonde under the promotional banner of Vince McMahon’s Titan Sports. Leonard would retire and un-retire two more times, finishing for good after a loss to Hector “Macho” Camacho in 1997, an event which also ended up falling under the promotional governance of McMahon, who helped to save the show from cancellation. In December of 1996, New Contenders Incorporated, the promoters of record for the bout, were asked by regulators to be investigated by the New Jersey Casino Control Commission for alleged ties to organized crime. The promotion’s chairman, Michael Blutrich, was also serving as a lawyer for the New York City gentlemen's club Scores, which had recently been raided due to suspected ties with the Gambino crime family. Due to that investigation, Sun International Hotels, Merv Griffin Gaming and Entertainment, and TVKO, HBO’s pay-per-view arm, all pulled out. Ultimately, the fight would go on with McMahon’s Titan Sports, and Caesars Atlantic City being asked by the fighters to come on board, with Camacho’s promoters, Bernard Dillon and Mike Acri, stepping up their financial obligations. All of the records from thirty years ago have fallen by the wayside. The site fee record fell first with Donald Trump bidding $11 million in 1989 in order to host the legendary 91-second Tyson annihilation of Michael Spinks. Leonard broke his own Vegas gate record with his third fight against Roberto Duran, in 1990. Since then, the record would be broken again, dozens of times. The same goes for the largest selling pay-per-view of all-time, as well as purse totals for superstar megafights. For example, earning a percentage of different revenue streams as Floyd Mayweather Jr. did, generating nearly a quarter of a billion dollars for himself in winning a one-sided 12-round decision against “Pac Man” Manny Pacquiao. That fight, of course, earned a record breaking 4.6 million buys at the record breaking price of $99.99. Utilizing the spaciousness of the 20-foot ring Mayweather’s camp had negotiated, “Money” would attempt to evade trouble for much of the round, avoiding exchanges with his heavier hitting opponent, and attemptting to steal rounds with dazzling displays of defensive prowess and punching speed. A universal betting favorite coming into the fight, the technique earned Mayweather a highly controversial decision with its fallout echoing throughout the sports world, quickly. Fans of Maywather rejoiced. Conversely, fans of Pacquiao were incensed. Feeling as though Mayweather was not looking to engage during a majority of the round, relying solely on defense and dazzle, some fans and many in the media would ponder aloud if such controversial decisions would finally be the nail in the sport's coffin. Judging from the thirty years that preceded us, the answer is a resounding no.